Camp Casey is now winding down, and in a few days it will all be packed up for good. Friday was clearly a day of preparation down there. There was not much scheduled. There was “peacemaker training” in the afternoon, to prepare for the following day. Johnny Wolfe, from the Crawford Peace House/Dallas Peace Center, led the training. We sat in on a little of it, and it seemed like the main goal was to have folks who would be looking out for trouble the following day, but who would be trained to respond in love and non-violence to anything that did happen. There was a palpable sense of concern out there Friday. Everyone knew the weekend would be big, but nobody knew whether it would be smooth. Everyone knew of the counter-protest groups coming from California and all over, and really no one knew what that would mean…would things go smoothly? With that many new folks, many of whom are angry (on both sides…) would tensions escalate into violence? Anyway, Ann Wright, the brains of Camp Casey, gave a impassioned plea for restraint and non-violent, peaceful action the next few days. Bumped into Tom Geddie down there. Tom is a great music critic and lover all all things Texas. He moved from Dallas to East Texas a few years back, and now actually lives just a few miles from my family’s lakehouse out there. Bill, Tom and me had some good conversations. I also got the chance to meet many of the new family members who had come in during the past week since I’d been there. Some of them had only arrive that day, or the night before. They all looked a little wide-eyed, and wondering about what their experience would be like. Person after person said that they simply felt compelled to come…compelled to to come and tell their stories and to be with other family members and vets. Saturday was the BIG day. I had to be in Waco for a funeral that morning, and so I actually had to drive by myself. Saw lots of folks I knew out there. There were probably ten or twelve folks from our church. Saw all my friends from the Dallas Air America listener group. Saw some musician friends from Austin. Caught up with some of the vets and family members who I’d met the Friday before. Since I came in the back way, I didn’t even see the majority of the counter-protesters. I heard they had a big demonstration –perhaps even with as many or more than were at Camp Casey II– but I never saw it. By the time I drove back through town in the late afternoon, most of them had left. The crowd at Camp Casey was HUGE. I mean HUGE. It was wall-to-wall people. The family members, as I’ve mentioned several times, were deeply touching to me. Specifically, I got the chance to meet Steve DeFord. 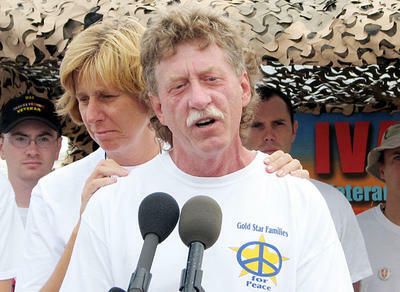 Steve DeFord is a Gold Star Father, whose son was killed in Iraq. On Friday, when I saw him, he seemed a little shell-shocked still by the whole experience of being at Camp Casey. His wife had been there my previous trip (and was present at the Friday Prayer Vigil, but had gone home and handed the baton off to Steve. It was clear that he still wasn’t sure about how much he would speak out, or what he would say. Joan Baez played all throughout the main event, leading the group in many classic protest songs. Cindy Sheehan gave quite a good speech, commenting a lot on the obvious growth of the Camp Casey movement. I have to say, that’s the thing that really astounds me too…just how much this movement grew in just a few short weeks. How amazing it was –almost like a paradigm shift– from that first trip I made when there were probably 60-70 folks out by the side of the road, and when I just happened to run for cover into Cindy’s tent shelter and get caught in the storm with Ann Wright. How amazing it was to now see the thousands there in Crawford. 2) Camp Casey II was being constructed. Cindy Sheehan’s being gone really probably gave the movement a depth it wouldn’t have had otherwise. It seems that this moment was when these other family members and vets who had been somewhat in the shadows up til then came into their own. Everyone realized that their stories need telling too. Everyone realized that, as Cindy Sheehan has said, the movement is bigger than Crawford Texas and Cindy Sheehan. So, I thought about all this, and what a turning point that Friday has been in retrospect, as I looked out over that HUGE crowd on Saturday. Teri Hendrix played after the main rally ended. She always plays, of course, with Lloyd Maines, whose daughter’s comment, several years ago, created a whole new verb. After her, James McMurtry did a set. I’ve been a big fan of his for years, and it was great to see him live for the first time. Sumer Erickson, Roky’s younger brother, followed him. It was really an awesome moment. Everyone was clapping along. 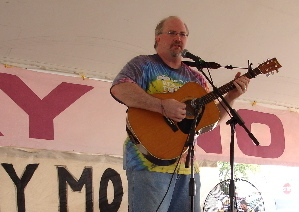 There were a ton of musicians, really good ones, waiting patiently in line to play, and so it was really very kind for Richard Bowden (formerly of the Austin Lounge Lizards, and organizer of the entertainment that afternoon…) to fit me in for the one song. I probably gave out 40 copies of Prairie Chapel Road to the veterans and family members, including one to Cindy Sheehan. The rest were left to be sold, all proceeds to the Crawford Peace House. It really was great to get to play the song again down there. It feels like it will probably run the course of its life soon….although it’s still being downloaded about 50 times a day right now. I’m just so honored to have had the chance to be even a small part of what I truly believe will be an historic movement. Bumped into Carter Thompson in the late afternoon, and offered him a ride back to Dallas. We drove back into town, and then back out to Camp Casey I one more time. Carter had never seen it. I really still don’t know what the counter demonstrations were like. I have heard folks say that some of them were pretty angry and vitriolic in their comments. And, if this account is any indication (the part about the “Protest Warriors” halfway down the story…), it’s probably a good idea both sides stayed away from each other, for the most part. We stopped by the Peace House on the way out of town, because Carter had never seen that either. Laura Flanders was doing a live broadcast of her radio show, and we stopped to listen for a while. The most amazing thing is that I bumped into the Burns Sisters! I’d seen Jeannie Burns as we were getting back off the shuttle to go home from that first Monday visit. So now it’s several weeks later, I’m back at the Peace House, walking into the side yard, and low and behold, all three Burns Sisters are there. I’m pretty sure I heard Susan Werner get introduced later too. Some pretty fantastic musicians came down to Crawford. I hear that Sunday was a pretty amazing day, with even more big name celebs coming by. I’m glad Martin Sheen came, and I admire him a great deal. I know that I have lots of friends, perhaps even some of you reading this, who probably have grave doubts about the whole “Camp Casey” movement. I can certainly understand that. But what I saw was as genuine, heart-felt movement, from folks who felt almost a pilgrimmage-like compulsion to come. Remember the Spielberg film “Close Encounters?” Remember how the characters simply have this compulsion to get themselves to that specific Utah mountain? That’s what I read in the face and stories of the vets, moms, dads, and other family members who came to Crawford. The just came because they had to come. They didn’t even know what they’d find when they got there. Sure, there were a lot of other distractions down there. But, at the heart, there were these folks, who feel they cannot be silent any more. In fact, some of them feel like they’ve been silent far too long. They are not professional politicians, so sometimes they don’t speak very eloquently. But, then, sometimes that very lack of “polish” gives them a genuineness that is often missing in our political discourse today. I know a lot of folks have a hard time with the idea of bringing home the troops right now. I certainly understand that reservation. But my heart has been touched by these family members who have poured their heart and soul out for our country. I mentioned Steve DeFord, one of the fathers I met down there. As I mentioned, Steve is a Gold Star Father, meaning his son was killed in combat in the Iraq War. On Saturday, in the midst of the big rally, in the tent filled with 2,000-plus people, I looked off to one side. Steve was just standing there by himself, looking very sad. So, I went over to talk to him. “What do you think of all this?” I asked. We both fell into tears and into a hug. Because I knew that for Steve, no matter what anyone does to try to end the war now, that would also always be true.